During a recent race, I found that when I would attempt to shift from 3rd to 2nd, the bike would sometimes drop into neutral. I began digging in to understand what was happening. 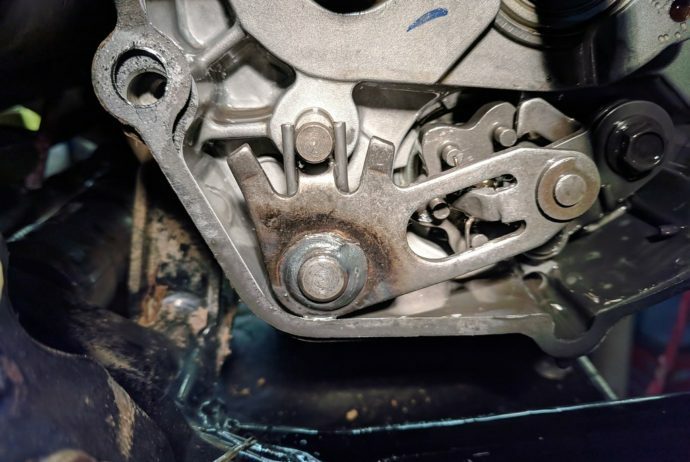 If you’re a TLDR type, its basically a poorly manufactured shift shaft that has too much slop. 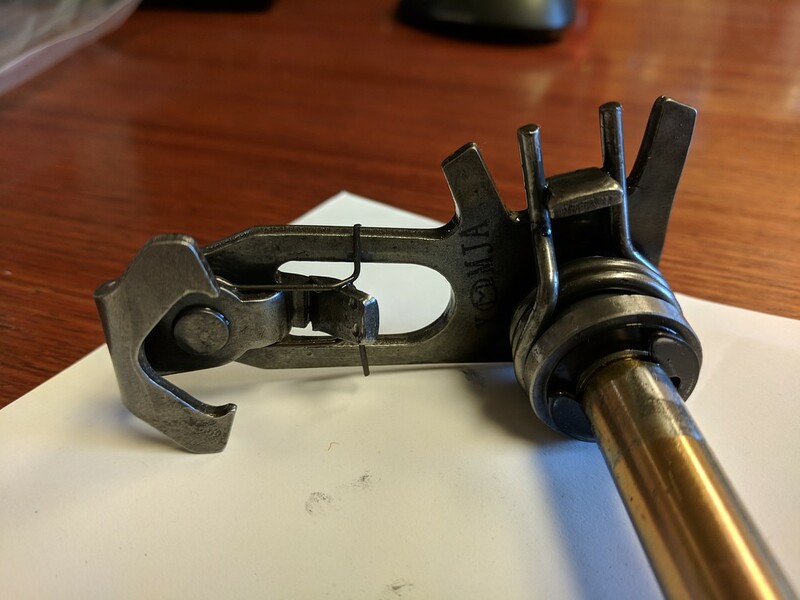 There is the additional possibility that the stop arm on the shift shaft was bent due to use, but I can not say 100% here. The tab on the left is what stops the shifter from rotating too far down (ie clicking down through gears). Arrow on the right is pointing to where the spring loaded shift pawl is connected to the main shift shaft arm. The first issue is that the tab on the left needs to be rotated in slightly. I’ll have a more accurate measurement later, but this allows the arm to rotate ever so slightly too far down, allowing the detent to slip over into neutral. This issue is exacerbated by the fact that where the shift pawl interfaces with the shift arm, is extremely sloppy. I believe that adding a bit of weld to the face of the shift shaft like @Jazzy6 will be required. 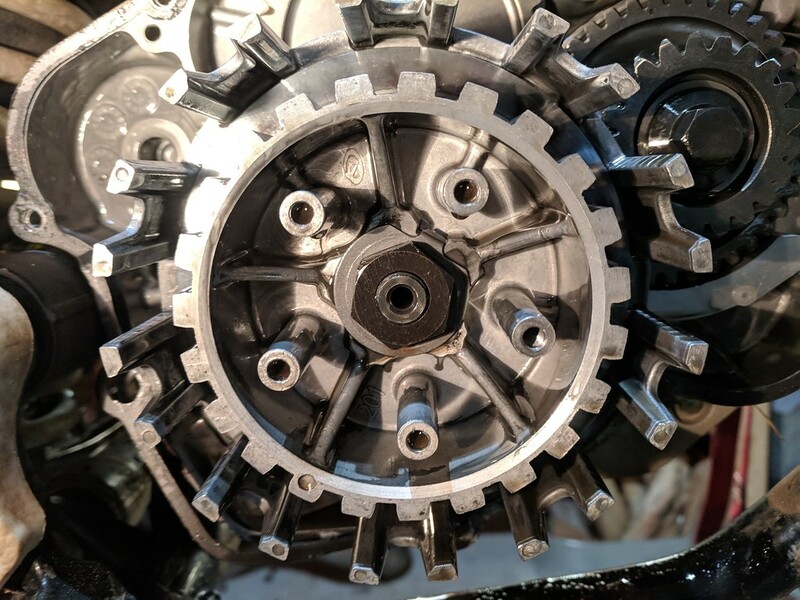 If the “stop boss” on the clutch cover wears enough, or the total slop in everything is too much, the shift pawl could lose contact with the shift star itself. Mine had a little bit of movement (in\out), but not enough to completely lose contact with the shift drum star. So I’m looking at this a couple ways. 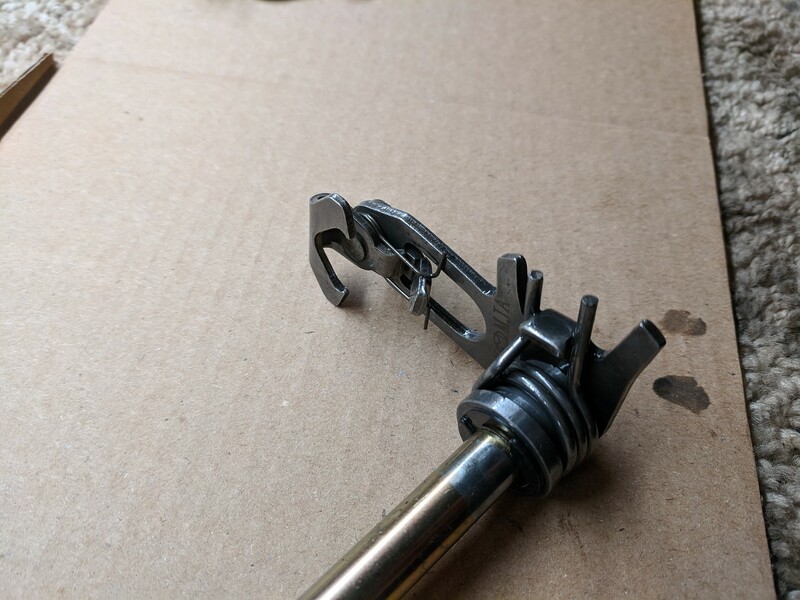 One, I can just weld the arm up to stop the movement of the shifter, thereby halting it from skipping past 2nd and into neutral. If I do this, I’d also look at welding a dot on the face to reduce\eliminate the in\out slop of the shaft itself. The other option is I go all in and make a new one. I don’t think I’ll do that, as it just doesn’t seem worth it. I wonder why they didn’t do a full loop over the tangs on this DT230 engine. 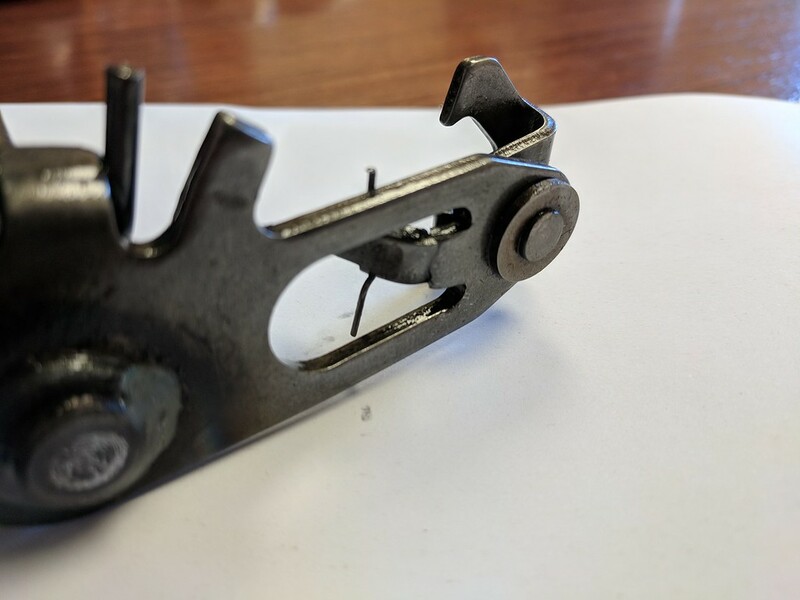 If Possible, I may weld an arm connecting the 2. I’ll verify if anything would interfere, but this would insure the arms don’t bend prematurely. Another tidbit….. 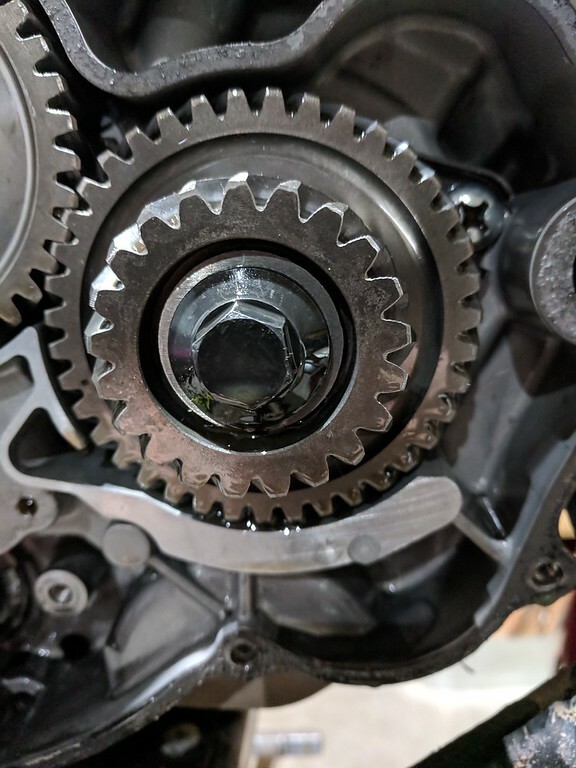 If you look at the 5 o’clock in relation to the main gear in this picture, you’ll see a gray looking spot on the smooth surface. That looks to be where either the water or oil pump gear is wearing into the surface of the cases. Not sure if it’s something to be concerned about, but already seeing a worn spot. Yes, that’s the nut holding the clutch basket assembly to the motor. You’ll note that while there is a lock washer in place, it was not set in the “locked” position anywhere. May be an isolated case, but not exactly what I’d call encouraging. Far from what I’d be expecting for a bike with less than 40 hours on it. Based on a discussion on ADVRider, another individual noted he had the same problem over a month ago, which was relayed to GPX. 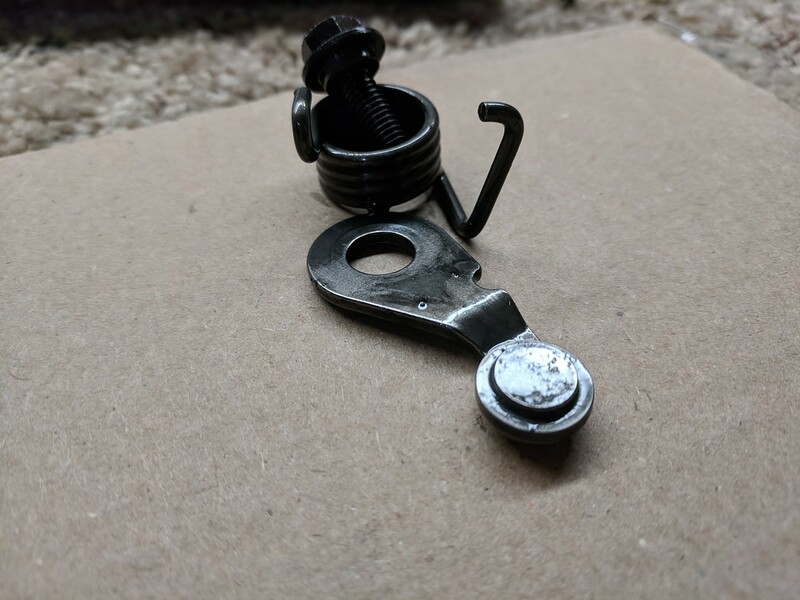 The issue stems from the tab which holds the pawl spring. You can plainly see on mine, that it is deformed and close to breaking off. Temporary solution will be to bend & weld this tab. I will also work on correcting the slop out of the pawl, is it’s quite sloppy.